All dressed up in pink and chocolate. Why give your special Valentine just one when they can have two? These easy mix-and-match iced sugar cookies are perfect for a gift, or just celebrating Valentine’s Day. Using Dorie Greenspan’s very easy Do-Almost-Anything Vanilla Cookie Dough and her Do-Almost-Anything Chocolate Cookie Dough, these recipes produce a total of 20-24 mix-and-match cookies. Or, choose just one method and double the ingredients for 20-24 cookies. Whisk the flour and cocoa together. Combine the butter, sugar, and salt in the bowl of a stand mixer, or using a handheld mixer, beat at medium speed for about 3 minutes or until creamy. Stop once or twice to scrape down the sides of the bowl. Combine the egg whites and vanilla extract. Reduce the speed to low and add the mixture. The dough may curdle, but it will smooth out once the flour is added. On low speed, add the flour in 3 or 4 additions, only beat until it is almost incorporated before the next portion goes in. Stop to scrape down the bowl as needed. Evenly divide the dough and shape into two disks. Wrap in plastic cling wrap and refrigerate overnight or for at least 4 hours. Working with one disk at a time, roll out to a thickness of ¼ inch. Using cookie cutters, cut into an even number of rounds and heart shapes, rerolling scraps as needed. Stack the shapes between parchment paper on a baking sheet and refrigerate for at least 1 hour before baking. Preheat the oven to 350 degrees. Line two baking sheets with parchment paper. Place the cookie dough shapes on the baking sheets. Sprinkle the hearts only with sugar. Bake for 19 to 21 minutes until the cookies’ edges start to become golden. Cool on the baking sheets for 5 minutes then transfer to wire racks to cool completely. Add the sugar and meringue powder to a bowl on a stand mixer fitted with a whisk attachment, or use a handheld mixer with a whisk attachment, and mix lightly together. Mix three tablespoons of the water with the vanilla and add to the dry ingredients. Mixing on low, slowly add the remaining water little by little until the mixture reaches the consistency of molasses. At this point, turn the mixer to high and whip for approximately three until the icing is light and fluffy with soft peaks like meringue. Add the food coloring and whip to distribute the color evenly. 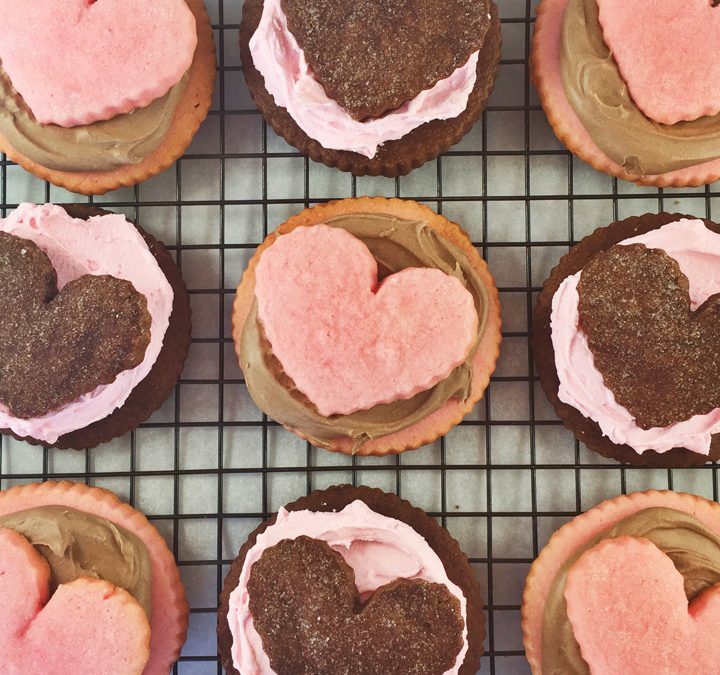 Assembly: Spread the icing on the rounds and top with a heart cookie. Make 10-12 cookies. Combine the butter, sugar, and salt in the bowl of a stand mixer, or using a handheld mixer, beat at medium speed for about 3 minutes or until creamy. Stop once or twice to scrape down the sides of the bowl. Combine the egg whites, vanilla extract, and red food coloring. Reduce the speed to low and add the mixture. The dough may curdle, but it will smooth out once the flour is added. On low speed, add the flour in 3 or 4 additions, beating only until it is almost incorporated before the next portion goes in. Stop to scrape down the bowl as needed. Evenly divide the dough and shape into two disks. Wrap in plastic cling wrap and refrigerate overnight or for at least 4 hours. Working with one disk at a time, roll out to a thickness of 1/4 inch. Using cookie cutters, cut into an even number of rounds and heart shapes, rerolling scraps as needed. Stack the shapes between parchment paper on a baking sheet and refrigerate for at least 1 hour before baking. Add the sugar, cocoa powered and meringue powder to a bowl on a stand mixer fitted with a whisk attachment, or use a handheld mixer with a whisk attachment, and mix lightly together. Mix four tablespoons of the water with the vanilla and add to the dry ingredients. Mixing on low, slowly add the remaining water little by little until the mixture reaches the consistency of molasses. At this point, turn the mixer to high and whip for approximately two-four minutes until the icing is light and fluffy with soft peaks like meringue.